In our home we have many Christmas decorations. Along the roof line is a set of lights designed to make Clark Griswold proud. In the front window is the Christmas tree full of memories disguised as ornaments. On the mantle is a Saint Nicholas statue given to us as a wedding gift many years ago. And in three prominent locations, we have nativity scenes. These nativity scenes are my favorite Christmas decorations . . . and I am not just saying that because I am a Pastor. I truly love these nativity scenes. I always have. As a kid, we had one that set on top of our cabinet television set and I used to love to see those simple figures in a tiny barn surrounded by fake hay. They were a real reminder of the reason for the Christmas season. When Kimberly and I got married, Kimberly brought a very special nativity set forward with her into marriage . . . a gift her mom and dad got for her one piece at a time during her growing up years. It is one of the greatest treasures we own. Each nativity set has a back story of how we came to own it, but also points us to the ultimate reason for why we celebrate Christmas at all — the birth of Jesus. Each set in our house is arranged similarly. All the pieces are crowded together around the baby Jesus . . . as they should be. After all, Jesus was at the center of it all that first Christmas night. However, what is sometimes lost in nativity sets is how those pieces ARRIVED at the manger scene. Unlike the pieces that adorn our mantles, the participants at the first Advent did not all come out of the same box. Most nativity scenes include 3 “wise men” or “magi.” Sometimes they are riding on camels and most every time they are carrying three neatly wrapped gifts. They are often painted the same color as the other pieces in the set. In our nativity scenes, they look like they totally belong. However, those familiar with first century Jewish culture would have been quite surprised at their inclusion in the story. By the first century, the Magi were considered to be more “wise guys” than truly wise. The Magi were an ancient order of star-gazers from Babylon who made a living interpreting dreams and foretelling the future. While there were certainly some honest men among them, their reputation had deteriorated toward “snake oil salesmen” – people who would tell you what you wanted to hear just as long as they could make a buck. Most people did not view them as honorable, and certainly, no one viewed them as godly. Metaphorically, these Gentile heathens were about as far away from the birth of the Jewish Savior as you could possibly be. The songs we sing of them talked about them traveling far to see Jesus, but their distance was even further spiritually than physically. For the wise men to look the part in our nativity sets, we should paint them contrasting colors and place them at the beginning of December in the garage while the rest of the pieces nestle together in the living room. • 1400 years before the birth of Jesus, Balaam issued a prophecy about a star rising for the Messiah. This led Jews to a belief that a real star would one day be a sign that Messiah had arrived. • 700 years before the birth of Jesus, Micah prophesied that the Messiah would be born in the little town of Bethlehem. • 600 years before the birth of Jesus, the Jews were taken captive by the Babylonians. The Babylonian foreign policy of the time was to take the best and brightest people of the lands they conquered back to Babylon to work for the improvement of their culture. One of the Jews exported to Babylon in this captivity was Daniel. After demonstrating his ability to interpret dreams, Nebuchadnezzar promoted Daniel to become the overseer of (you guessed it) the Magi – see Daniel 2:48. Daniel would have been in a position to influence this group with his understanding of Jewish prophecy, which would have included the idea that one day the Messiah would be born in Bethlehem and a star would mark his arrival. This story was passed on from generation to generation of Magi until the birth of Jesus. • At the time of Jesus’ birth, God sends a special star in the sky to guide the Magi from Babylon/Persia to Israel to see the newborn king (see Matthew 2:1-12). For 1,400 years, God had prepared a plan to invite those who were far off to come near and into a relationship with Himself. The night Jesus was born, the star rising in the sky made sense to the Magi because of years of divine planning. The pieces that began in the garage were brought into the living room by God’s grace. HEROD: Hey Jewish religious leaders . . . there are some Magi out here who have traveled hundreds of miles over hard terrain following a special brand new star that they believe is leading them to see where the Savior of the world was born. 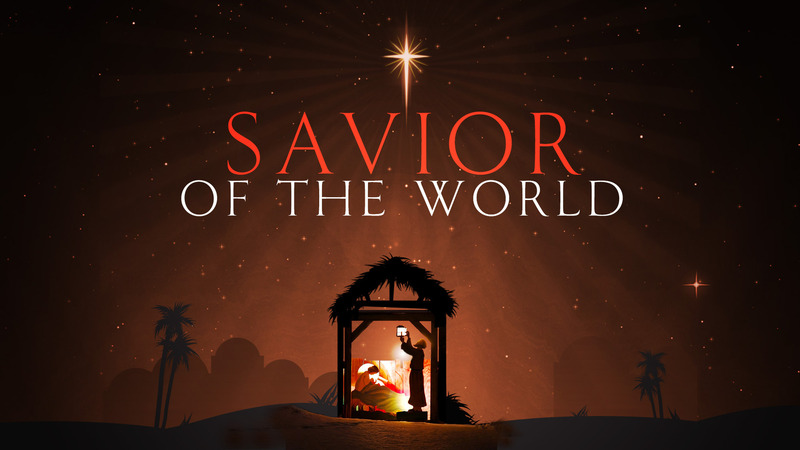 Do you know where the Savior of the world is supposed to be born? RELIGIOUS LEADERS: Yeah, the Savior will be born in Bethlehem. The town directly underneath that brand new and bright shining star. HEROD: Oh really? Should we go check it out? RELIGIOUS LEADERS: Nope. Can you pass the pretzels? We are busy watching some paint dry. The religious leaders of Israel WERE in the same box as Jesus. They were painted with the same colors. They did look like they belonged in the same room . . . however, the story of Matthew 2 shows us that sometimes those who look near are really VERY FAR away spiritually. The contrast between the Magi and the Scribes and Priests is shocking. Those who were far are brought near while those who looked near are revealed to be very far away. The implications of this are extremely important to us at Christmas time. Are you someone who is currently very far away from the Savior? Someone who is painted a totally different color than most church people? Maybe your life is marked by addiction, abuse, or sensuality. Maybe you are known by your peers for your marginalized business ethics or immoral lifestyle. Maybe you even follow another religion and do not own a Bible. Because of the sin in your life, you appear to be in another zip code compared to Jesus, much less in the same room. This Christmas, are you someone who is far from Him? Or, are you someone who has grown up inside the church. You were dedicated at First Baptist Church, confirmed in the Catholic Church, and attend a non-denominational church . . . you just want to make sure your bases are covered! Do you have multiple bibles in your house, never miss a History channel documentary about the historical Jesus, and have a set of Jimmy Stewart “It’s a Wonderful Life” morals. Do you realize that it is possible to have all these things . . . to look like you belong . . . yet to never really have begun a real relationship with God? The beauty of the Christmas story is that there is hope . . . for people who are both FAR AND NEAR. If you feel very far away from the Savior today, know that God has been working since the foundation of the world to get the message of salvation to you. The combination of the life of Christ, the preservation of God’s Word, the sending of the Holy Spirit, and your network of friends, family, and opportunities have served as a “star” to invite you to the manger this Christmas. The same set of signs have also been shared with those who are “near” the church. The big question is: will you (like the Magi) follow the signs God has given and worship the Savior this year, or will you simply enjoy some pretzels and ignore the real reason for this season (like the Jewish religious leaders)? To those who are far or near, Jesus is the “good news of great joy for all the people.” He is our Savior, so come let us adore Him.